Cardiff Devils put on a spectacle in their final home game of the regular Elite League season to beat MK Lightning 9-1. Goals from Sean Bentivoglio, Layne Ulmer, Gleason Fournier, Evan Mosey, Charles Linglet (2), Matt Pope (2) and Joey Haddad sealed the win. Belfast Giants' narrow win against Dundee Stars means the Devils were unable to lift a third successive title on their own rink. 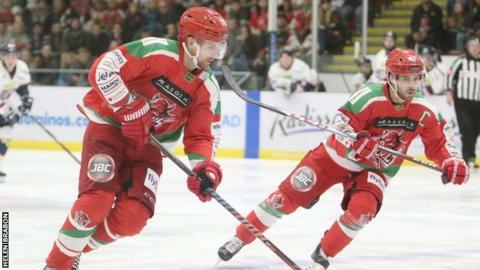 A point against Coventry Blaze will seal the title for the Devils. Cardiff started in perfect fashion, scoring after just 32 seconds through Bentivoglio to ease the nerves of the sell-out crowd at the Viola Arena. Chances were aplenty for both sides in the early stages and Lightning should have equalised but they failed to capitalise on a three-on-one powerplay opportunity. And they were soon made to regret it when Ulmer doubled the Devils' advantage on the powerplay after 7:30. Yet another penalty against Lightning gifted the Devils more time on the powerplay and Fournier put the Devils three goals to the good with less than 15 minutes played. Even at full-strength Lightning struggled defensively to handle the threat of the Devils and Mosey's long range strike added the shine to what was a dominant first period. Linglet's brilliant solo goal set the tone for another one-sided period as he extended the Devils' lead to five before two goals Pope made it 7-0. As soon as it was seven it was eight, top-goalscorer Haddad finishing off a swift Devils counter-attack. Lightning almost got on the board early in the third period when Devils' Bryce Reddick slipped while retreating but Ben Bowns was equal to Tim Wallace's effort. Josh Batch then missed the chance to put the Devils nine goals up on his 500th appearance for the club, Patrick Killeen with the smart save at close range. Linglet got his second of the night in a closely-fought third period to cap off a resounding home win for the Devils. Lightning did get a much-celebrated consolation goal with 43 seconds remaining through James Griffin but that did not diminish the Devils fans' cheers. All eyes will now be on Coventry on Sunday night as the Devils need one point to clinch a record third-successive Elite League title.